I headed back to the farm for the weekend to help sell at the market. 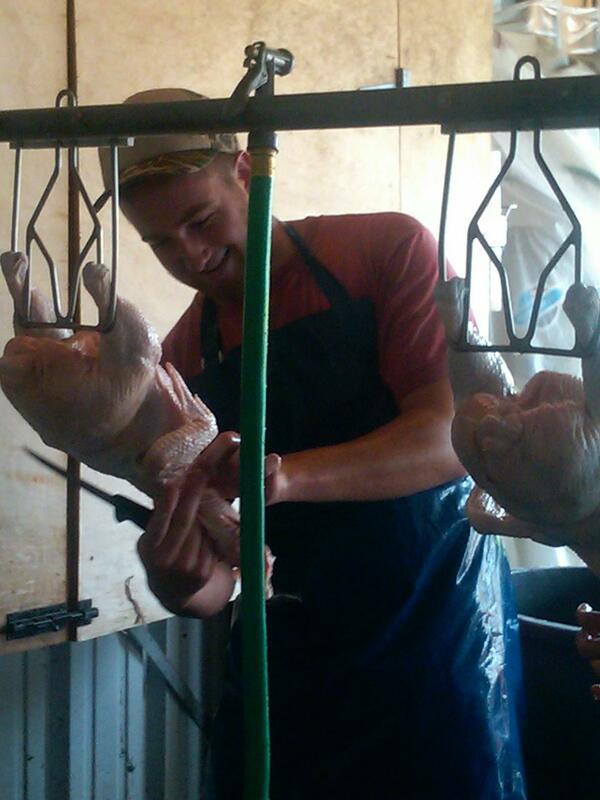 I spent the entire summer raising 100 broilers and now it was time to sell the 400 lbs of chicken at the farmers market. We decided to sell the chickens in cut up sections since no other farmer at the market sold chicken this way. Many people were surprised that we now offered chicken cuts because we were know as the "beef people" Overall it was an exciting weekend. People at the market talked to me about my internship and college and what my future plans were after graduating. We had gotten back feedback from one person so far and they loved the chicken, and they are looking forward to trying other cuts. This is week six of my internship and the weather was a little cooler this week. 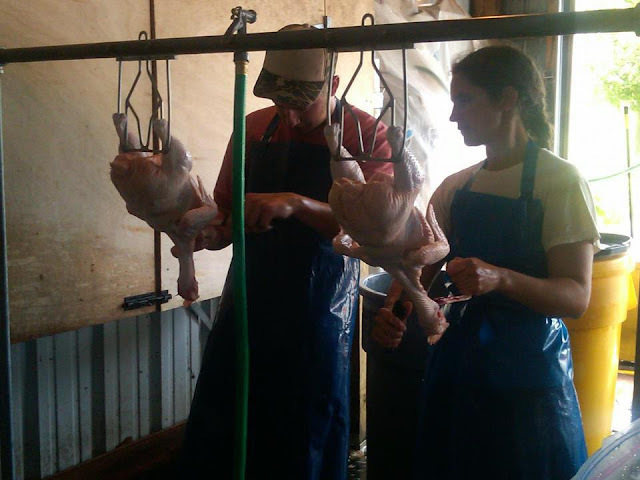 The meat birds are ready to be moved out of their brooder and onto the pasture but because of the rain storm, we have to delay this until next week. 18 of the eggs in the incubator hatched and 15 of them were moved into the brooder. With this batch we had a bad hatch rate. This could have happened due to the fluctuating temperatures inside the incubator and the number of eggs that were fertile. Unfortunately I received a phone call last night with bad news that an animal had found it's way into the brooder area and ate all 15 baby chicks. Luckily, the 51 broilers where unharmed. I guess this is something you need to be prepared for while living on a farm. On the bright side, the few calves that had the infection are doing better and we are now up to a total of 7 calves. We are still waiting on 3 more heifers to calve. I was able to help bottle feed a calf this week that was looking a little "runt-like" and what a challenge that was. First I had to help Jeanmarie catch the calf as she bottle fed it. Two week old calves are a lot stronger then you think. After multiple tries I finally was able to catch and hold on to it. Greg and I unloaded 2 hay wagons and 1 straw wagon this week and I finished the rest of the week out visiting the Stockton farmers market.